Beaudoin, Gérald A.. "Delgamuukw Case". The Canadian Encyclopedia, 08 January 2019, Historica Canada. https://www.thecanadianencyclopedia.ca/en/article/delgamuukw-case. Accessed 19 April 2019. Since the arrival of Europeans, First Nations in British Columbia have sought to make the provincial authorities recognize Indigenous peoples’ title (i.e., ownership) to traditional territory. The Gitxsan and Wet’suwet’en (see Dakelh) nations tried to negotiate on ownership with the province, as well as with the federal government, but their efforts were ignored. After years of failed negotiations with the provincial government, in 1984, the hereditary chiefs of both First Nations filed a land title action with the Supreme Court of British Columbia. The suit claimed title to over 58,000 km2 of land in northwestern British Columbia. The Indigenous nations wanted to protect the land from logging and to have the province officially recognize their title as well as award compensation for any loss of land. The two First Nations jointly launched the action against the government but they each claimed title over distinct lands. The trial began in 1987. This case is commonly referred to as the Delgamuukw case because Earl Muldoe (or Muldon) Delgamuukw, a Gitxsan man from Kispiox, was one of the claimants. An art instructor in the years before the first lawsuit began, Muldoe is a master carver whose works include masks, totem poles and bentwood boxes (see Indigenous Art in Canada). He was awarded the Order of Canada in 2010 for his art and his role in establishing oral history as valid evidence in Canadian courts. The name Delgamuukw is a hereditary chief name, passed down from generation to generation to new Gitxsan chiefs. Earl Muldoe held the title of Delgamuukw when the trial began in 1987. Another commonly cited claimant of the case is Dini ze’ Gisday’ wa (also known as Alfred Joseph) of the Wet’suwet’en nation. Born in 1927, Joseph was a hereditary chief, carver and advocate for Indigenous cultural education, helping to create courses for the University of Northern British Columbia (UNBC). He was granted an honorary doctorate from UNBC in 2009. During the trial before the Supreme Court of British Columbia, Gitxsan and Wet’suwet’en elders testified about their land using oral histories and in their own languages (see Indigenous Languages in Canada). Judge Allan McEachern ruled on 8 March 1991, determining that any title the Gitxsan and Wet’suwet’en may have had was extinguished (i.e., taken away) when British Columbia joined Confederation. The Gitxsan and Wet’suwet’en appealed McEachern’s ruling to the Court of Appeal of British Columbia. On 25 June 1993, the appeal court concluded that the government has a duty to consult with Indigenous peoples before they begin any projects that may infringe upon Indigenous rights. However, the appeal court ultimately agreed with McEachern that the Gitxsan and Wet’suwet’en did not have title to the land in question. Following an abandoned attempt at treaty negotiations with the province of British Columbia, the claimants decided to appeal to the Supreme Court of Canada, which heard their case on 16 and 17 June 1997. Six months later, on 11 December 1997, the court’s ruling addressed a number of issues, including the extinguishment of Aboriginal title, the use of oral history in testimony and the content and extent of Aboriginal title. The court found that the provincial government had no right to extinguish the Indigenous peoples’ rights to their ancestral territories. Reaffirming the decision in the Van der Peet case (1996), the court deemed that oral history is an important type of evidence that courts must treat as equal to other types of evidence. The court also clarified the content and definition of Aboriginal title, as previously explored in the Calder case (1973). It defined Aboriginal title as Indigenous peoples’ exclusive right to the land, and affirmed that Aboriginal title is recognized as an “existing aboriginal right” in section 35 of the Constitution Act, 1982. However, the court also acknowledged some limitations with Aboriginal title. Traditional lands cannot be used in a manner that is “irreconcilable with the nature of the claimants’ attachment to those lands.” For example, a nation with ancestral claims to fishing rights may not use the waters in a way that would destroy its value for fishing. If Indigenous people wished to use the lands in ways that Aboriginal title did not permit, then the lands must be surrendered. Aboriginal title cannot be transferred to anyone other than the Crown. 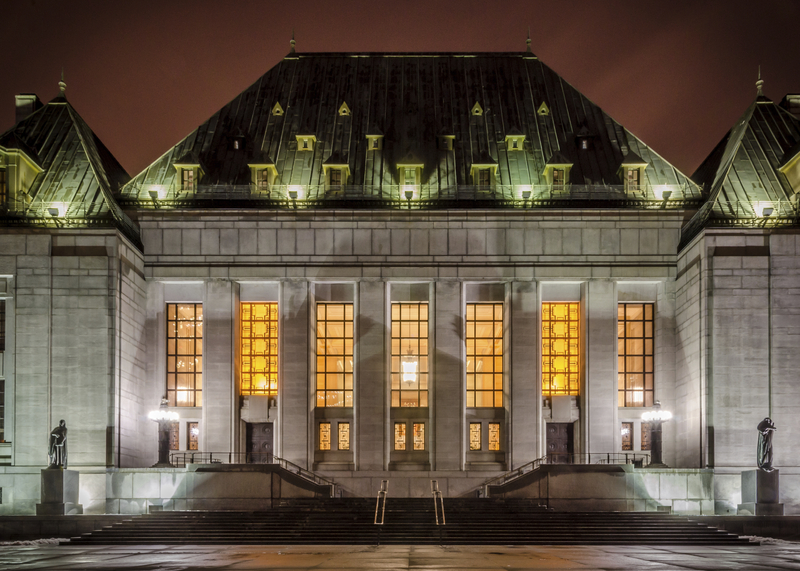 In order to clarify how Indigenous nations must demonstrate Aboriginal title, the court created a test based on three key points: sufficient, continuous and exclusive evidence of territorial occupation. The Indigenous nation must have occupied the territory before the declaration of sovereignty. This means that the Indigenous nation must have demonstrated to other First Nations	and to Europeans that it clearly used and occupied the land. This is different than the ruling in the Van der Peet case (1996), which established that Indigenous peoples need to prove that their traditional rights were integral to their culture when Europeans arrived. In the Delgamuukw test, it is sufficient to say that occupied land was integral to their culture at the time of contact. If present occupation is invoked as evidence of occupation before sovereignty, there must be a continuity between present occupation and occupation before the declaration of sovereignty. In other words, there must be evidence of a continuous ownership of the land. However, it is not necessary to prove a perfect continuity; the demonstration of a substantial maintenance of the bond between the people and the territory is sufficient. In this respect, the Supreme Court	held that oral evidence could be admitted as proof. At the time of declaration of sovereignty, this occupation must have been exclusive. This means that the land had to have been the exclusive territory of an Indigenous nation, although they could have shared it with another Indigenous nation. The Delgamuukw case is an important one in Canadian law because it provides information about the definition and content of Aboriginal title. The ruling also clarified the government’s duty to consult with Indigenous peoples, and affirmed the legal validity of oral history. After the case, other First Nations, most notably the Tsilhqot’in people in 2014, used the Delgamuukw decision in their own land claims cases. Despite the importance of the case, treaty negotiations between the two nations, the province and the federal government continue. Various companies operate in their traditional territories without permission, and there is division within the community over participation in large energy projects, such as the LNG pipeline that is planned to run through traditional lands. In December 2018, Wet’suwet’en people prevented some Coastal GasLink representatives (whose pipeline is supposed to transport natural gas to the scheduled LNG facility) from passing through Indigenous territory (see Pipelines in Canada). The RCMP arrested 14 people associated with this incident on 7 January 2019. Three days later, Wet'suwet'en chiefs and the RCMP reached a deal to allow road access for pipeline workers. Therefore, while the Delgamuukw case raised and clarified issues relating to Aboriginal title, it did not outright resolve them. Richard Daly, Our Box Was Full: An Ethnography for the Delgamuukw Plaintiffs (2005). Antonia Mills ed., ‘Hang Onto These Words’: Johnny David's Delgamuukw Evidence (2005). Brian Thom, “Aboriginal Rights and Title in Canada After Delgamuukw: Part One, Oral Traditions and Anthropological Evidence in the Courtroom,” Native Studies Review 14.1 (2001): 1-26, and “Aboriginal Rights and Title in Canada After Delgamuukw: Part Two: Anthropological Perspectives on Rights, Tests, Infringement & Justification,” Native Studies Review, 14.2 (2001) :1-42. First-hand account Read Bryan Williams’ article about his experiences as a lawyer for the Gitxsan and Wet’suwet’en peoples during the Delgamuukw case. Gitxsan Explore the official website of the Gitxsan First Nation. Wet’suwet’en Explore the official website of the Wet’suwet’en First Nation. First-hand account Read Peter R. Grant’s article about his experiences as a Crown lawyer during the Delgamuukw case. CBC News Chantelle Bellrichard and Michelle Ghoussoub report: “14 arrested as RCMP break gate at Gidimt'en camp checkpoint set up to stop pipeline company access” (7 January 2019). Primary Source Read the Supreme Court’s decision on the Delgamuukw case. The Discourse Trevor Jang writes about the Delgamuukw case and the LNG development, “Twenty years after historic Delgamuukw land claims case, pipeline divides Gitxsan Nation” (7 February 2017). Analysis Authors from the Aboriginal Mapping Network provide a paper summarizing the Delgamuukw case.